How To Save Substantial Money On Your Next Mailing. Are you feeling pressure to reduce mailing costs? Below are eleven services that accomplish this goal. 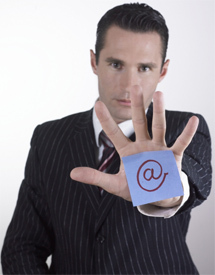 Think you know all the available services to clean your mailing list? Do you know all the suppressions available to lower your mailing quantity while increasing response rates? Here are 11 services that will help you save money on your next mailing. The potential cost savings of these eleven services is huge - Possibly 10 percent of printing, postage and list acquisition costs. If a mailing costs $.40 each when each cost is factored in and you mail 100,000 pieces, the savings on a 10 percent reduction would be $4,000.00. Since you are eliminating bad records, duplicate records and people who should not be receiving your offers, response rates will not drop. In fact, by ridding your mailings of bad records and increasing the number of mail pieces that get delivered, your response rates will actually climb! In order to mail at reduced postage rates, your address list must be verified and corrected using the United States Postal System (USPS) National Database. This is called CASS certification. If the data record matches against the postal file a zip + 4 is appended to the data record so a correct zip+4 barcode can be generated. The Post office will use this barcode to help sort the mail and as a result, the Post Office will give you a postage discount. Zip code and street misspellings are corrected during this process too. This important process helps improve deliverability of your mail pieces by correcting addresses and also helps the duplicate elimination service (described below) find additional duplicate records since address will look more alike. Over 44 million Americans move every year. The post office National Change of Address file goes back four years and contains over 160 million records of people and families that have moved. The post office is pressuring mailers to perform timely NCOA updates by requiring a “move update” service be performed on your mailing list at least within the last 95 days prior to any first class or standard rate mailing. Besides giving you the opportunity to update your records with new addresses, the NCOA will also help eliminate people who have moved and left no forwarding addresses. This service corrects addresses located in areas that have undergone permanent address conversion. The LACS database consists of address conversions (changes) of mostly old rural and street address name changes. On average, LACS will update around 1% of a file. This process applies to consumer and business addresses. Example: 123 RR 4 becomes 123 Main Street. If a customer or prospect is on your list at both locations, our merge/purge will be able to find and eliminate one of the records. Helps prove that a given address is a valid address. The DSF2 database contains all domestic addresses serviced by the U.S. Postal Service. 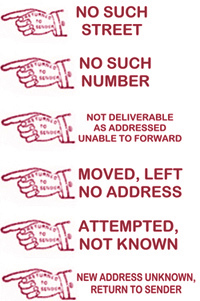 If your data record is not found on the Postal file it is a good indication you have a non-mailable address. This service will match records on your file that have been identified as either missing or having an incorrect Apartment Number, to a National database in order to append or correct the Apartment Number. Takes addresses on your file and adds or corrects elements to make them deliverable addresses. On average, AEC will update and fix 1.53% of a file. 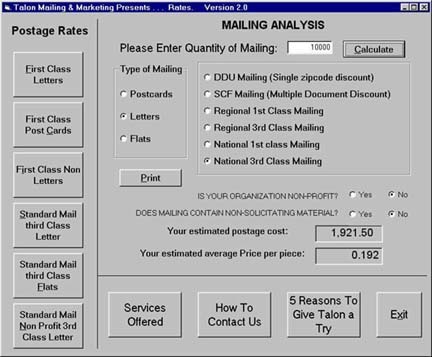 Example: A customer on your mailing list is on the file at 123 Main street. If this is not correct, AEC will fix the address and it will become 123 West Main street. Again, this helps the Duplicate Elimination service find more duplicates. By using the above-mentioned services, we can make duplicate records that used to not look alike, and help them match much more closely. The above mentioned services, followed by a Duplicate Elimination will reduce postage and mailing costs significantly. Should you be concerned about losing customers or wanting to see what your possible duplicates really look like, you can request a suspect dupe report. 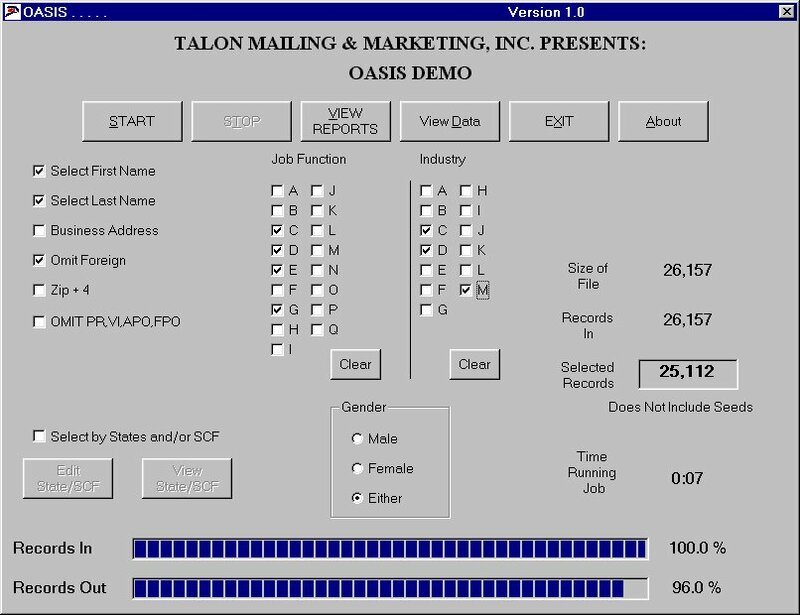 Talon produces either a printed version or an electronic version. This means your staff can go through your customer list manually. This will take some time but it’s worth it to insure that only the names you really want to take out get eliminated. Besides cleaning your files, suppressions help to eliminate people who should probably not be receiving your offers. While we would encourage you to keep all customers on your file, suppressions offer an excellent opportunity to prospect and grow your customer list, while simultaneously helping to reduce costs and raise response rates. This file contains the names of over 3 million consumers who have requested they be taken off of direct mail solicitations. This database contains over 40 million names of people who have passed away during the last several years. The match percentage will vary depending on the accuracy and age of the data in your list. The average percentage updated is 1-3%. The source of this processing is a database of over 10 million businesses. This service also typically averages over 1 percent of a file. Eliminate mail going to prisoners. Usually less than one percent of a file will be found, but with such a low cost and a positive upside it can really help eliminate potential problems. Study Shows First-Time Online Donors Often Do Not Return. By Stephanie Strom, NY Times. The Internet can be a valuable fund-raising tool for charities, but it is not a replacement for direct mail or other forms of fund-raising. People who go online to donate to charity for the first time often do not return to the Internet to make later gifts, according to a new study examining the experience of 24 nonprofit groups. The findings suggest that while the Internet can be a valuable fund-raising tool for charities, particularly in soliciting gifts after disasters like Hurricane Katrina, it is not a replacement for direct mail or other forms of fund-raising. The study was done by Target Analytics, a unit of Blackbaud Inc., which provides software and services to nonprofit groups. Of those who did make additional gifts after an initial online donation in 2006, according to 12 organizations offering data in January, 37 percent never gave another gift via the Internet, while 18 percent gave electronically in one year and through other channels in another. Charities have been using the Internet for fund-raising for more than a decade with mixed results. “People are asking us all the time why we don’t reduce mailing costs and save paper with online fund-raising, but the simple fact is that people come online to give a gift once and don’t repeat,” said Jennifer Tierney, development director at Doctors Without Borders in New York, which took part in the study. The 24 nonprofit organizations had 9.5 million donors and total revenues of $747 million. Charity fund-raisers offered several possible explanations for the study’s findings. Many donors using the Internet to make their first gift to an organization are responding to a disaster like the Asian tsunami or Hurricane Katrina, and those givers may not be interested in supporting a group’s continuing work. Another issue is that nonprofit groups tend to add donors acquired online to their direct mail lists, which encourages those donors to give in more conventional ways. “I think what we’re learning is that we need to be less worried about what channels these donors use and offer them a variety of channels through which they can give,” said Mr. Smith of CARE. Now you can see the new stadiums we have heard so much about! Talon has great seats for you to win. Friday May 15th, Yankees vs. The Twins 7:05 PM. Monday April 27th Mets vs. The Florida Marlins 7:10 PM. socialmention.com - a social media search engine that searches user-generated content such as blogs, comments, bookmarks, events, news, videos and more. Google finance - a broad range of financial news, information about stocks, mutual funds, public and private companies. Rememberthemilk.com - Free! A great way to manage your tasks. Never forget the milk again. Cracked.com - A funny website filled with funny videos, funny pictures, articles and a whole bunch of other funny stuff. Superbowl-Commercials.org - This site has some of best television commercials of all time; video of the hundreds of superbowl commercials from the 60s to 2009. BJPinchbeck.com - A great site to help your kids with homework. LoonaPix.com - An easy and fast way to edit your photographs and make them hysterically funny too.